Escape to the ultimate romantic den, complete with a patio which is perfect for candlelit dinners while the sun disappears behind the emerald hills. This property is in a great location with the golden shores of Polzeath beach nearby. Welcome to the Atlantic coast of North Cornwall. With fabulous self catering accommodation and celebrity endorsed eateries transforming the coast into top class destinations, North Cornwall magically combines trendy with wildly beautiful landscapes. Here, you’ll find surf spots, sensational beaches, spectacular coastline, dramatic cliffs and a huge number of activities. This offer is based on a 1 bedroom house. 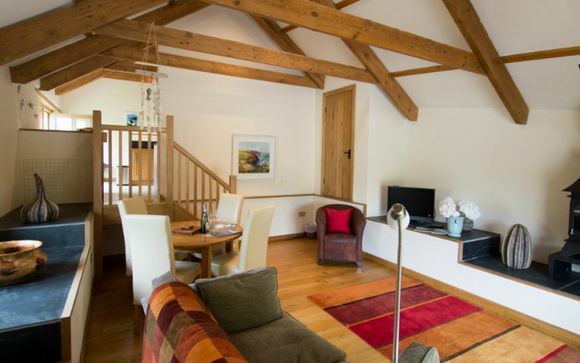 For the ultimate romantic den, this beautiful barn conversion adjacent to the lakes at Roserrow and only yards from the golf course, is the perfect choice. This sweet hideaway for two is steeped in character with beautiful wooden beams and floors, yet retains all of the modern amenities needed to make it a home away from home. The open plan living/dining space leads via double french doors to a private patio area, perfect for enjoying the famous Cornish sunsets and the views of Roserrow's lakes. The spacious master bedroom has been lovingly decorated in a soothing neutral palette, and the family bathroom is well equipped with a large walk-in shower. 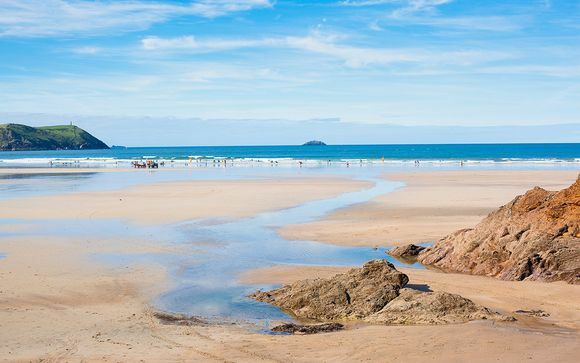 A superb property in an ideal location for beach and surfing holidays, Polzeath is only a 20 minute walk, where there is an incredible golden beach, lively cafes and atmospheric restaurants and two surf schools with equipment hire. This wonderful holiday home is also just a 5 minute walk from The Point at Polzeath, with a wide variety of leisure activities to keep everyone entertained whatever the weather.